This Lotus necklace, which features as a project in Geometric Beadwork Volume 2, combines a pendant which can also be worn as a brooch, a hidden clasp and a beaded chain is possibly my favourite ever project. From the second I began this I fell in love with it. Beaded using peyote stitch with cylinder and seed beads with a dramatic centrepiece this incorporates lots of geometric beadwork. The 13-page pattern include full step-by-step instructions and diagrams to bead the chain and the pendant. Cylinder beads e.g. Delicas or Aikos in size 11. 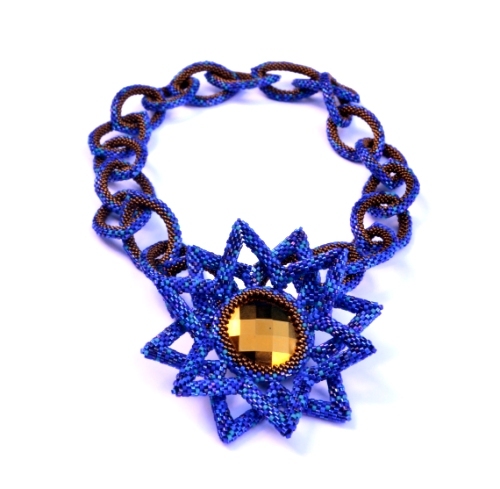 This necklace appeared as a project in the December 2012/ January 2013 issue of Beadwork Magazine.